Kingston Data Traveler SE9 32GB Pen Drive is a unique and new version travel storage product that has USB 2.0 i Interface and is supported by Windows XP-SP3, Windows XP-SP2, Windows Vista, Windows 7, Linux 2.6, Linux 3.0, Mac OS-v10.5, Mac OS-v10.6, Mac OS-v10.7, Mac OS-v10.8. 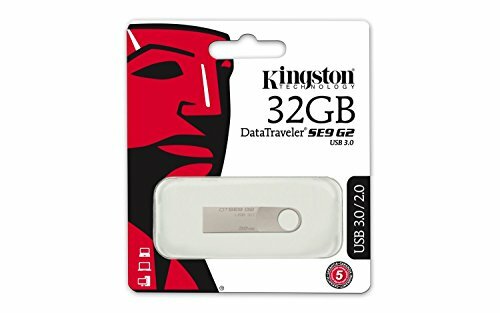 This 32GB Kingston will be very to carry your important documents while traveling and also taking regular backups of your files. Unique and Useful Pen Drive The Kingston Data Traveler SE9 32GB is unique and most useful pen drive that has a stylish metal case along with a large ring that can be used to attach the pen drive easily. It makes a wonderful companion for people who travel a lot as they can safely carry their important documents as well as use it for backup. Enough Memory Space With 32GB storage capacity, the Kingston pen drive can be used with all PCs, notebooks and MacBooks. Kingston SE9 32GB is a very user friendly pen drive made of good quality material that makes it durable and secures all the information stored in it. Kingston – A Well Known Brand Kingston SE9 32GB has many additional features along with the well known brand name. It comes with a 5 year warranty and technical support free of cost with the reliability and durability of Kingston products.